Jim Tracy, left, will serve as NATE’s 6th Chairman. Assisting him will be Jim Miller, Vice-Chairman, and Kari Carlson, Secretary/Treasurer. The National Association of Tower Erectors (NATE) announced today that Board of Directors’ members Jim Tracy, Jim Miller and Kari Carlson were elected to serve on the Association’s Executive Committee for the upcoming year. The Association made the announcement on the first day of the NATE UNITE 2016 Conference and Exposition in New Orleans, La. Jim Tracy of Legacy Telecommunications, Inc. was elected to serve as NATE Chairman. Tracy has been a member of the NATE Board of Directors for five years and has fulfilled a variety of other leadership roles during his tenure with NATE, including Vice Chairman of the Board of Directors and Board Oversight for the Member Services Committee. With his election, Tracy becomes the 6th Chairman in NATE’s 21-year history. Former Board Member and Chairwoman Pat Cipov elected not to run this year after serving the organization in both roles for many years. Jim Miller of EasTex Tower, Inc. was re-elected to serve as the NATE Vice Chairman. Miller has been a member of the NATE Board of Directors for seven years and been active in leadership roles as Board Oversight for the Safety & Education Committee and a member of the Legislative & Regulatory Committee. Kari Carlson of Tower Systems, Inc. was re-elected to serve as NATE Secretary/Treasurer. Carlson has been a member of the NATE Board of Directors for nine years and has also served on the Association’s Financial Committee and Industry Relations Committee. 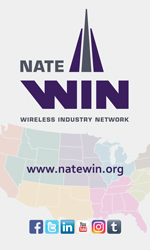 “I am honored and humbled to assume the mantle of NATE Chairman and look forward to working with the Executive Committee, Board of Directors, Standing Committees, Administrative Staff and our entire membership to continue to elevate industry safety and advance the Association’s strategic industry initiatives,” stated Tracy. “I would like to congratulate Jim, Kari and Jim on being elected by their colleagues on the NATE Board of Directors to serve on the Executive Committee,” stated Executive Director Todd Schlekeway. “NATE’s dynamic team consisting of the Executive Committee and Board of Directors members will continue to provide the steady leadership and vision necessary to ensure the Association continues on an aggressive growth trajectory and carries out our ambitious agenda,” added Schlekeway. Wireless Estimator will provide continuing coverage of the event.